Our journey with the Pandavas in their period of exile commenced this year on the 15th January 2018 in the blessed presence of H.H Pujya Sri Ramswarupananda ji Maharaj reached a conclusion on the 11th of March 2018. Through Pujya Acharya Sri Prem Siddharth ji’s vivid narrative, every episode played picturesquely in front of our eyes. The pearls of wisdom that were hidden in these allegories were revealed magnificently by Pujya Acharya Swamiji in this year’s 52-day Mahabharata Jnana Yagnam. The Nahusha Samvada in the Ajagara Parva enlightened us on the relevance and the correct interpretation of Varna Dharma. The Doctrine of Karma and its mechanism was dealt with never-before depth to banish all doubts from our minds about the workings of Action and Result. The Markandeya Samaasya Parvam taught us many subtle truths including the importance of Daanam, the process of Srushti and Pralaya, the Yuga-Dharmas etc. This year, Pujya Acharya dealt with a part of the Markandeya Samasya Parvam leaving us eager for more teachings in the next Jnana Yagnam. Pujya Acharya Swamiji and Mataji were welcomed with Purnakumbham by the disciples amidst the chanting of Vedic hymns. Pujya Acharya commenced the final discourse of this Jnana Yagna after Jyoti Prajwalanam and Namasankeertanam. 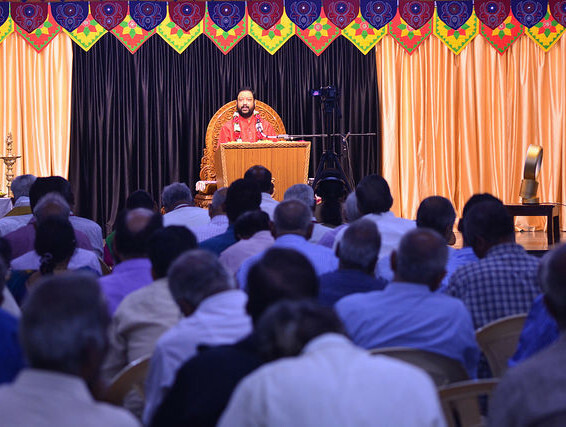 After the discourse, Sri MVR Raju, former IPS officer and an ardent student of Pujya Acharya summarized the teachings of this year’s Jnana Yagnam and the clarity that he was bestowed through them. This was followed by Aarati offered to Sri Krishna Bhagawan and a short felicitation ceremony. A few people who have always supported the activities of Arsha Vidya Vahini and are committed to Shastra Adhyayanam were blessed by Pujya Acharya Swamiji and Mataji with Prasadam. 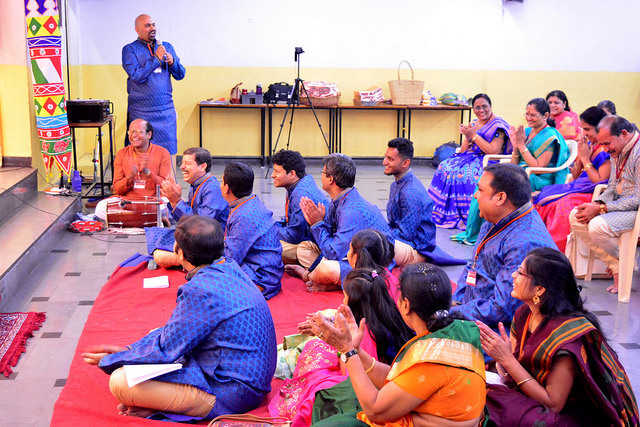 The student-volunteers who offered their seva to ensure the success of this Jnana Yagnam were given gifts by Pujya Swamiji and Mataji as an expression of their blessings and love. 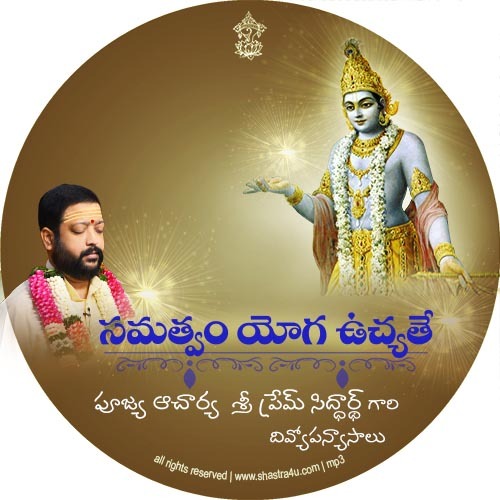 Mahabharata Arati and Guruvandanam were followed by Vastra Vandanam where the disciples chanted the Sankalpa mantras before offering Vastram to Pujya Swamiji and Mataji. The events of the day concluded with the devotees seeking the blessings of Pujya Acharya Swamiji and partaking the Mahaprasadam. In the course of the Mahabharata discourses, Pujya Swamiji had explained the significance of serving the Go-Mata and the importance of Go-Daanam. As though to exemplify such noble thoughts, during the Purnahuti celebrations, Pujya Acharya Swamiji made a contribution to the Kamadhenu Go-Shala which is the oldest Go-Shala in the city of Hyderabad. This contribution was received by Sri Prabhu Datt ji Maharaj (12th Peethadheesh of the Sri Samartha Narayana Maharaj Ashram; descendant of Swami Sri Samarth Ramdas ji Maharaj) who manages the Go-Shala. The Kamadhenu Go-Shala located in Jiyaguda on the banks of the Moosi river, serves over 5,000 cows many of which have been abandoned by their owners, by providing them shelter and medical care. During the course of this Mahabharata Jnana Yagna, the following CDs of discourses by Pujya Acharya Sri Prem Siddharth ji were released and are available for purchase in our online stores. Pujya Acharya Swamiji delivered these discourses based on Gita during the Gita Jayanti Jnana Yagnam 2017. 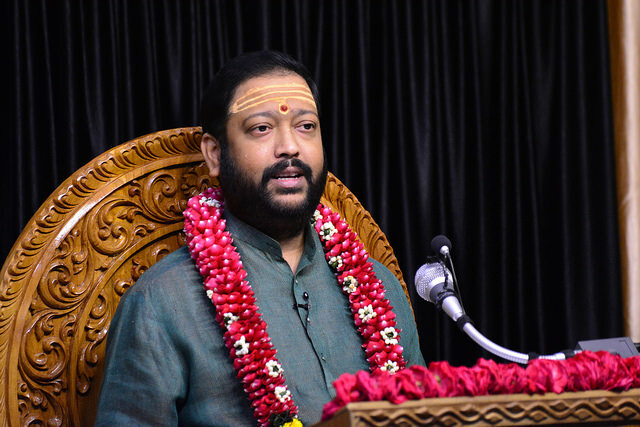 These discourses were delivered by Pujya Acharya Swamiji during the Gita Jnana Yagnam 2015. Pujya Acharya Sri Prem Siddharth ji delivered these discourses in Sri Venkateswara Temple, Novi, Michigan, USA.